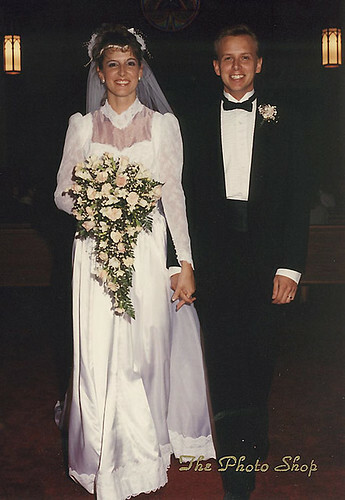 We celebrated our 26th wedding anniversary on May 26th. Actually, we didn’t celebrate it, we were both too busy working to really acknowledge the actual day, but we did go out and eat at Outback Steakhouse the day after our anniversary. (Side note: We took a cruise around the Hawaiian Islands last year for our 25th wedding anniversary – no, I haven’t written about that time yet … stop nagging). It was a great dinner. I had steak tips and Kevin had a Ribeye, I think. We talked about possibly going somewhere for vacation this year but I think I have him convinced to just keep it low key this time, stay home, save some money, pay off our homequity loan. This is going to make me sound spoiled, and I guess, since we’re being honest here, I AM spoiled, but I’m burned out on cruises. We’ve taken a cruise for the past seven (?) years straight – I need a break. Let’s stay on land for a bit. In return, I get to do what I want to do on the weekends – keep myself company, read, write, take naps, it’s a win-win situation, to be honest. Our wedding was pretty low key. Since neither one of us belong to a church, I shopped around for churches until I found a really pretty one and we rented it. We paid for our own wedding and we kept it cheap. (Side note: my mom made my dress – isn’t it pretty!?) But we couldn’t justify spending thousands of dollars on something that would last two hours and be over with. We preferred to save our money and spend it on the honeymoon (Cozumel Mexico). A friend of mine did my makeup and hair, we drank punch out of fancy paper cups and I wore ballet slippers because I didn’t want to be taller than Kevin. Kevin forgot to wear black socks with his tux so the photographer, (who nearly had a heart attack), had to put my bouquet of flowers in front of him to disguise his white basketball socks when he sat on the pew steps for pictures – good times. I knew he was the one as soon as I met him. I didn’t think about marriage when I met him, but I knew what I felt for him was different than what I felt for any other guy. He made me laugh, he made me want to be a better person. He was frugal (he was going to school to be an accountant – DREAM MAN), resourceful, smart and sweet. Our marriage has not been perfect, we’ve had our shares of ups and downs (7-year itch – that was a really tough, unpleasant year and that’s all I’ll say about that), but we grew, we changed, we adapted. I can honestly say we’re not the same people we were when we got married, we’re better. What’s the secret to our successful marriage? Patience. Respect. Communication. Carving out time for each other. Really, what I’m telling you is nothing new. All of the marriage advice sites you read tips on are right – it’s about listening and appreciating each other and not taking each other for granted though I confess, we do that sometimes. I can’t imagine sharing my life with anyone else. I have a very difficult time allowing anyone close to my heart, but I can honestly say that Kevin is near and dear to me and that scares me a bit. I was reading back when he had his motorcycle accident in 2010 and I can’t begin to describe to you the debilitating fear I felt when went to the hospital for the first time and saw him lying there so helpless – he’s the least helpless person I’ve ever known in my life. I think that accident also brought us closer – how can you not be drawn closer to a person when he relies on you to help him poop? I think people regard marriage as throwaway events nowadays. “Well, if this doesn’t work out, we’ll just get divorced.” I can’t tell you the number of times I’ve heard people say that and it horrifies me. If you honestly think that, then do yourself, your partner, and any future children a favor, don’t get married. If you’re already looking for ways to get out of a serious commitment before it even begins, there’s your sign – don’t go down that road. We made a pact, we would never mention the “D” word. And we haven’t, save for that patchy 7-year itch period of time. Any fights we had, we cooled down, we listened to each other, we owned up to our own shortcomings and assumptions and we compromised. You have to be willing to swallow a bitter humility pill once, twice, a hundred times, when you’re married for the long haul. I found this interesting bit on how to have a successful relationship from Tech Insider. Watch, learn, absorb, practice.